Dealing with a seasonal water system may be the least enjoyable part of owning a lakeside home or rural getaway, but it doesn’t have to be this way. The frustration and uncertainty endured draining water pipes in the fall and filling them again each spring is something that Canadian plumber Brian Feeney set out to change. He lives and works in Ontario’s cottage country, and six years ago he got fed up watching property owners struggle (and frequently fail) with seasonal water systems. You’re probably not thinking about the chore of draining your system very often during the year, but cold weather comes early in many areas. Now’s the time to set yourself up to do things differently this fall. Feeney invented something he calls The Clozer. It’s a portable, flow-activated electric pump unit with a built-in antifreeze reservoir. You can see how it works by clicking on the video here. The pump connects to ordinary valves spliced into the hot and cold lines of your water heater. It forces non-toxic plumbing antifreeze through all water supply pipes as taps, fixtures and appliances are turned ON one at a time. Turn a valve OFF when the flow changes from clear to the pink colour of the antifreeze and you’re done with that section of plumbing. You don’t have to crawl under the cottage to drain pipes, not even drain traps. Let a little antifreeze go down the drain after water from the last valve is displaced and it’ll freeze-proof the drain trap, too. 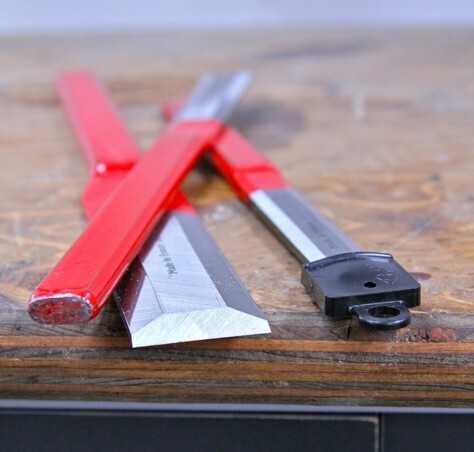 It takes less than an hour to do a typical home or cottage and you can save a couple of hundred dollars a year compared with calling in a pro. So, why not just drain your entire water system and be done with it? This sometimes works, but not in every situation. There are two problems. First, few plumbing setups are made to allow complete and reliable draining of the entire system. And second, even when you do drain the pipes, condensation can occur in the pipes afterwards as fall weather cools off. Condensed water can settle into low spots in the pipes, freezing and bursting when deep cold comes. Replacing water with antifreeze in hot and cold supply lines prevents burst pipes, but it’s also the only reliable way to protect washing machines, dishwashers, ice and water systems in fridges and tankless water heaters. When spring comes you simply turn your water pump back on, run each fixture for a while to displace the non-toxic antifreeze, then start enjoying the place. It’s almost like winter never happened. Feeney has designed two versions of his portable pump system. The Clozer Original for pros and the Clozer II for homeowners. Both hold 15 litres of plumbing antifreeze. 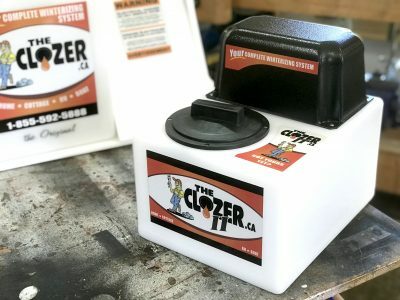 The Clozer II is less expensive and in my experience it’s all any individual property owner needs. Since draining seasonal systems is only half the battle, Feeney also created something called the TC-3 to make priming water systems easy in the spring. 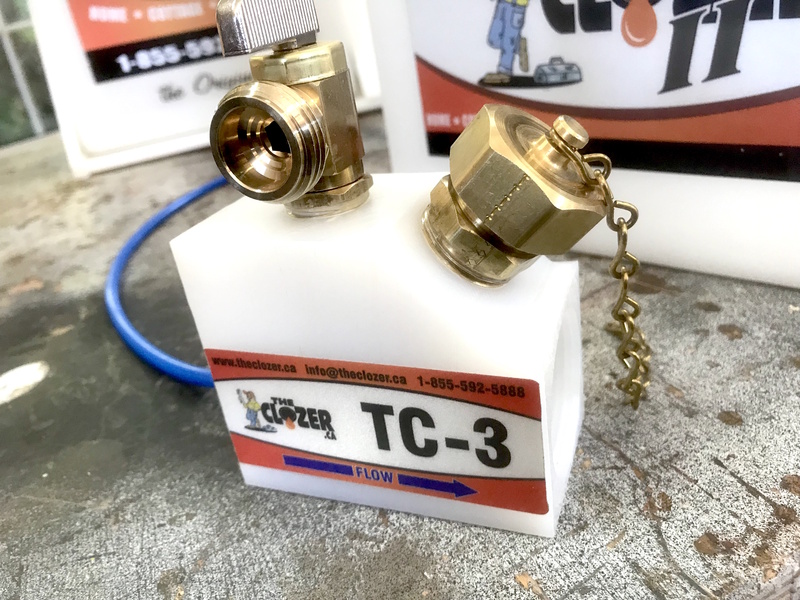 The TC-3 fitting connects permanently to the intake line that draws from a lake, river or well, located just downstream from the pump. It has a 1/4” diameter plastic tube that extends all the way down inside the intake line to the foot valve. Connect The Clozer to the TC-3, fill the reservoir with water, then turn it ON. The pump fills the intake line from the foot valve up, displacing air in the system that comes out the vent valve in the top of the TC-3. If you don’t mind using additional antifreeze, repeat the process again in the fall using antifreeze and you can winterize a water system supply lines and pump without wrestling with pipes, foot valves, submersible pumps or any of the other nonsense that makes cottage owners doubt why they put up with their place. Pump leathers and O-rings last longer if they’re kept wet all the time, too. Brian’s invention also makes sense for snowbirds who leave full-time city houses empty during winter. I hear from these people all the time. Shut off the water supply, fill the lines and appliances with antifreeze and you won’t have worries about pipes freezing and bursting in the event of a long-term power failure while you’re down south. I’m always amazed at what happens when a cold climate meets a little Canadian ingenuity.